For many of us, we do not know the feeling of helplessness and loss from a house fire. A small family in Lautoka fell victim to a house fire in July of this year. Asish Kumar is from Saru in Lautoka. He is married with 2 children. His eldest is in primary while his youngest is in kindergarten. The family were not home when the incident occurred. When the fire had erupted, neighbors broke the windows and doors of the house in an attempt to put out the flames, without realizing that they allowed more oxygen into the house. Oxygen fuels fires and within minutes the house was engulfed in flames despite all efforts by local fire authorities to save the home. At the time we took this interview, the family were unaware of what caused the fire. Johness Surend, Terminal Manager Lautoka, and Abhishek Kumar Sales Executive Western, visited the family on the 19th of July. After hearing of their loss the duo requested Fiji Gas support for the family. 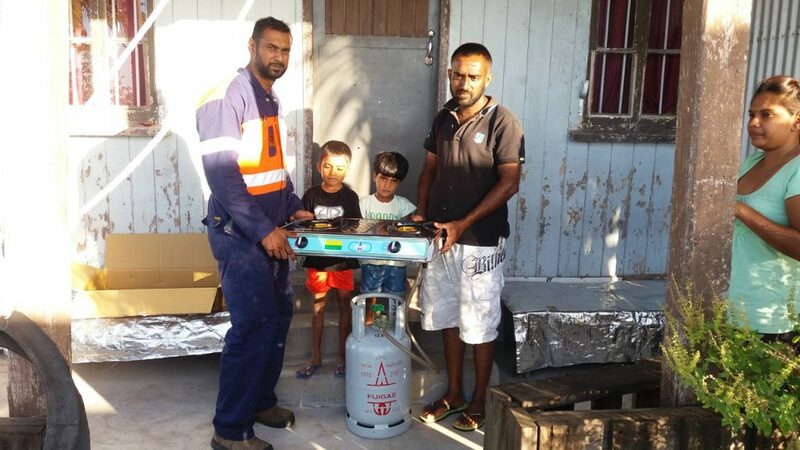 A 2 burner stove and a new full cylinder of gas was donated to the family to assist with cooking, enabling the family to concentrate on other necessities for their new home. We wish the Kumar family all the best as they rebuild their lives and their home. We hope that we have been of some small assistance.